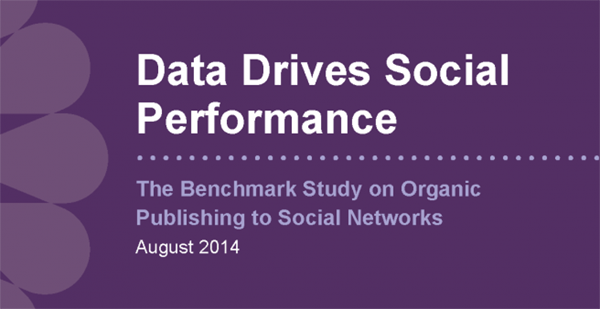 Today we're excited to publish Data Drives Social Performance: The Benchmark Study on Organic Publishing to Social Networks. This piece of research has been several months in the making, and spans 1.6 million posts that generated nearly 1.5 billion engagements (nearly 1,000 engagements per post!). Much attention has been given over the past six months to the decline in organic reach on social—yet at SocialFlow we continue to see companies have great success with their organic publishing. There is still significant organic attention to be had out there, for companies that are smart about how to pursue it. Our white paper describes what it means to take a 'data driven' approach to social publishing. You'll see that shifting from Scheduling posts to a Data-Driven approach requires a different mindset. We use the analogy that it's a bit like moving from meals every day at a fixed time, to instead eating meals when you're actually hungry. Only in this case, it's when your audience is hungry for content. We're hoping that this data will be liberating to social media managers and editors. By eliminating the time and energy spent guessing about when to post, there is more time for them to create content, engage with audiences, and tie those results back to their companies' business objectives. We hope you find the analysis to be useful, and invite you to contact us if you'd like to learn more.